Il Best Western Padre Island è situato nel centro di Corpus Christi. L'hotel è vicino alle principali attrazioni turistiche. Approfittate tutto l'anno del miglior prezzo garantito e di offerte esclusive. Camera con un letto king size. Vieni a rilassarti sulle splendide spiagge di Corpus Christi soggiornando presso il nostro hotel di Padre Island. Il Best Western Padre Island è la meta ideale per turisti e viaggiatori d'affari che cercano un comodo accesso alle spiagge, al Padre Island National Seashore e alla Texas A&M University. Goditi il panorama della baia di Corpus Christi e la vicinanza alle attrazioni e agli eventi del centro città durante il tuo soggiorno. Tutti gli ospiti dell'hotel potranno iniziare la giornata del modo migliore gustando una colazione all'americana gratuita che comprende uova, piatti caldi a base di carne, vari tipi di pane, cereali e molto altro. Rilassati nelle nostre camere spaziose e dotate di frigorifero e microonde, alcune delle quali affacciate sulla baia di Corpus Christi. Avrai a disposizione acqua in bottiglia gratuita e un bollitore per tè e caffè. Se stai organizzando un evento, chiedici informazioni sulla nostra area per meeting e banchetti. Potrai prendere il sole accanto alla piscina all'aperto e gustare spuntini gratuiti nella hall. Faremo il possibile per offrirti un soggiorno comodo durante la tua visita a Corpus Christi e Padre Island. La nostra posizione a soli 19 chilometri circa dal centro di Corpus Christi è perfetta raggiungere i ristoranti e le attrazioni locali. Scegli il nostro hotel quando visiti familiari e amici presso la Texas A&M o vuoi vivere una vacanza alla scoperta del vicino Padre Island National Seashore. Che tu sia qui solo per una notte o per un soggiorno prolungato, il nostro hotel pluripremiato ti offre il massimo del confort. Prenota subito sul sito web bestwestern. com per ottenere la tariffa più bassa disponibile grazie ai nostri prezzi bassi garantiti. "good quality at affordable price"
nice hotel very conveniently located do downtown as well as to padre and mustang island. clean and very gentle and helpfull staff (had problems with my door-lock). 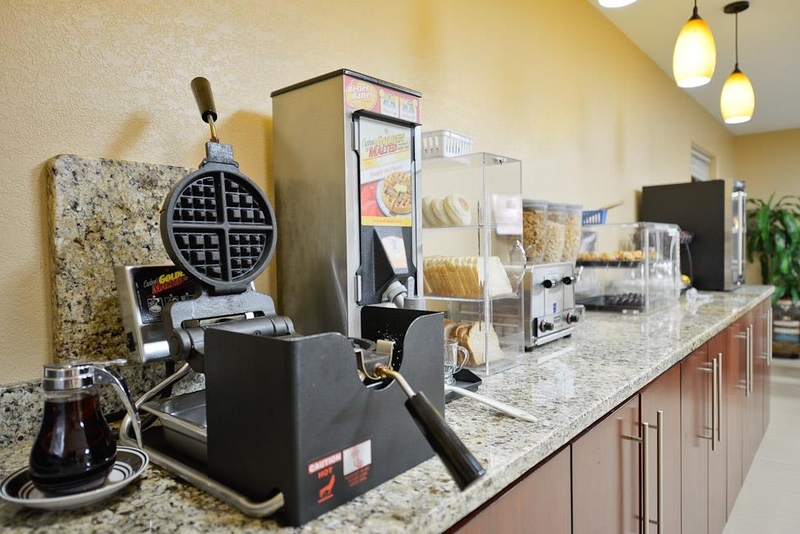 full breakfast buffet with wide selection. "Outstanding Staff, Well Managed, Nice Clean Rooms"
We made a very late reservation and arrival (about 3 am) after problems at the Days Inn (roaches). Hotel rooms were in short supply. Hayden, who was fast, professional, and friendly was on duty that night and quickly found the reservation which I had made directly with Best Western. He selected a room and provided key cards. We quietly moved our bags into the room. No problems. I took a quick look at the breakfast area and it was spotless. The next evening we tried to turn on the TV but could not find the remote. I went to the desk and requested a TV remote. Sandra said she wanted to test the batteries to be sure it would work and would bring one down to the room right away. In less than 2 minutes she arrived and provided a working TV remote. She was very helpful, friendly and professional. We tried the breakfast one morning and liked it. Annette was the responsible party. There was plenty of food and coffee. Everything was clean and bright. It was a good experience. We stayed for 5 days. The room rates went up on weekends. Not surprising as the location is on the island. Everyone did an excellent job and seemed to enjoy working there. The "maid" that cleaned the room was male, and did a very good job. I would definitely stay there again. "The 1 that got away"
I was excited about my 1st stay at the Padre Island! The pricing of the rooms were on the high side, so expectations were high. The room was average at best. Not what I was expecting when paying almost $200 per night. As a travel blogger, I stay in a lot of hotels in Texas. This Best Western is one i've Always enjoyed visiting. Great location. Good value, and high standards of cleanliness. I recommend this hotel to all my friends and my GrayTripper blog followers. As a travel blogger, I stay in many hotels in Texas. 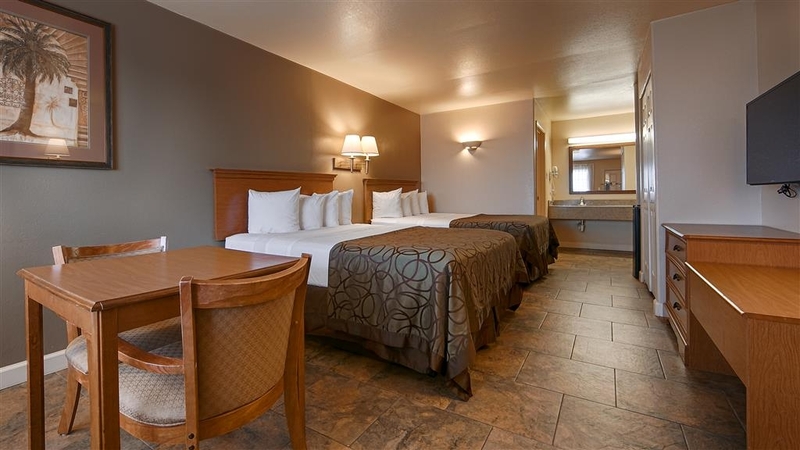 I have been going to this Best Western for years and find the location, the cleanliness and value of this Best Western makes it a great place to stay. Even though it was cold and rainy outside our room was very cozy and comfortable. There was a little problem with the keyless entry but it was fixed right away.The service was great the facility was clean. I would definitely go back. "Basic accommodations at a good price." We booked this hotel based on strong reviews and low price. The room was comfortably spacious and very clean. There was a decent breakfast. The desk attendant was helpful. All the rooms are accessed by exterior doors. It was reasonably quiet, except for the people outside our room who were departing in the wee hours. 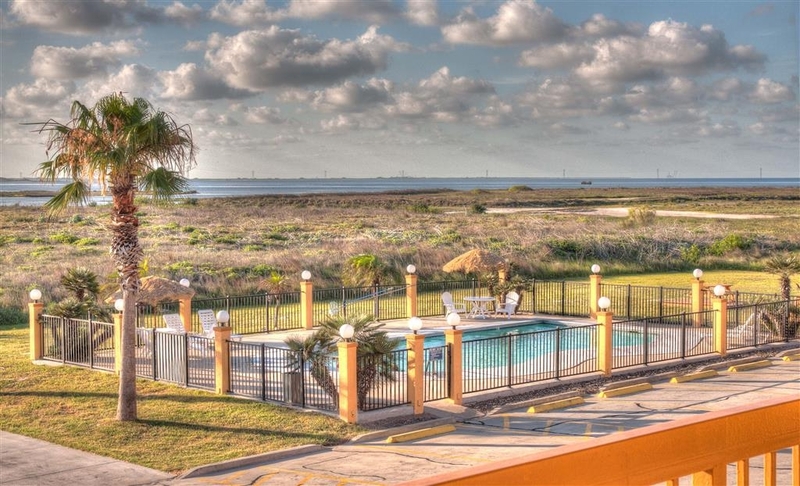 "A very nice hotel at a great price"
This hotel is located just off the bridge and highway on Padre island. This was a safe spot to say with lovely sunsets and birdlife all around. Check in staff were warm and very friendly, lots of parking spaces. The room we had was on the second floor it was clean and comfortable but the table with two chairs needed replacing in our room. Close to Corpus Christi just a short drive over the bridge and we drove to Mustang Island and the Ferry to Port Aransas and the road back to Corpus Christi. I'm not entirely sure why there are so many negative reviews of this place. Its located on the highway but the hotel owns a former restaurant pad-site in front of it which they have turned into a garden with palms and other trees -- so view of the highway is obscured and I did not notice any sound from either of our second floor rooms. The rooms have been recently renovated and are clean and in good repair. The parking lot is very well illuminated. Staff are very friendly and helpful. My bed was comfortable -- I believe the mattress was also new. The lobby and breakfast was standard continental items -- toast, sausage, egg, juice, pastries. The location is very convenient to Padre Island, the Mall and other commercial shopping areas -- and only minutes from downtown. 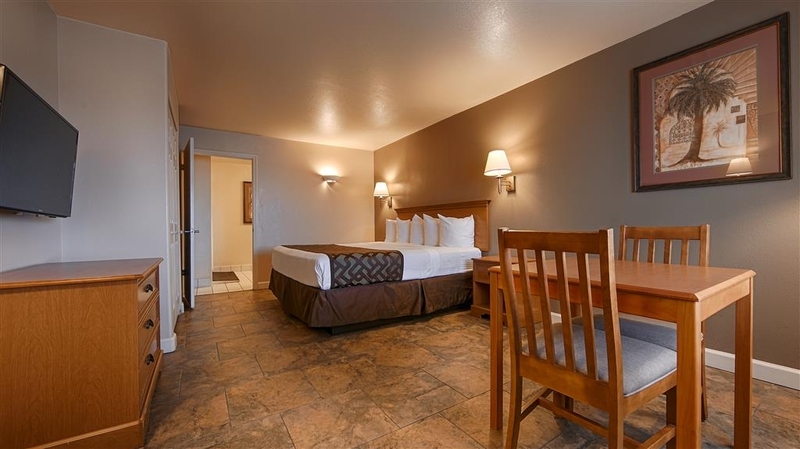 Overall the Best Western Paradise Inn is comfortable and convenient location for families and individuals looking for a no frills but clean and safe place to stay in Corpus. The bed was super comfortable, the room was clean and updated! There was a good variety of breakfast foods to choose from and the hot food was fresh. The staff were very friendly and welcoming! Will definitely be back. Do not count on quiet or a good breakfast but the staff was friendly. The ice maker was broke but could go to desk for some. Room was clean and had all what you needed except TV guide for channels. Not the best of the Best Westerns we have stayed. "Really nice place in great location"
This is really a nice place! The breakfast is GREAT, it's in a central location, rooms are comfortable and clean. Close to beaches, shops, restaurants. If you have dogs, there's lots of thorns in the fields surrounding the place. The way that Padre Island configured traffic needs some work, because you are continually make U-turns to get places, but oh well. We are here in off season so can only imagine how fun it is in the summer. "Updated and upgraded interiors "
Recently upgraded and updated rooms, pleasant staff, with small breakfast buffet with eggs, sausage, waffles, and other items. Coffee was well stocked, and breakfast area kept clean. Outside stucco under repair for cosmetic damage. Love this place. Convenient to everything. Food, gas, beach, marina, and boat launch. Everyone here is great. A wonderful place to stay. Rooms are very clean. We stayed up stairs and the room was very big. We will be staying here alot. Thank you everyone for the wonderful stay. Barbara S.
This Best Western location on the island in Corpus Christi is absolutely impeccable. The staff are super friendly and even fun to joke around with. The place is spotless inside the rooms as well as the lobby. The breakfast in the morning is so delicious and there is a good spread of items. The waffles are our favorites. We won't stay anywhere but here! "Nice hotel with Great service!" We stayed here on October 26th. The hotel is situated very conveniently on the Island close to restaurants, beaches and fun tho us to do. Great staff with high service. Breakfast is good. Recommend staying here!!! While still in Harvey recovery mode, the service was great, the room was clean, comfortable, and acceptable. Breakfast was offered and was the usual for a reasonable hotel. Price was acceptable as well. My wife and I went down for two days to fish and relax. We did both. Its proximity to a prime fishing spot like the packery channel and bait shops is the best in the area. The view was great! The best part about this little hotel was the staff. May was the head housekeeper and she was super Nice. As i passed buy she told me good morning and good luck fishing. As I went to my truck i passed two more ladies and they said the same thing. The lady at the front desk was also just awesome. I will definitely put this hotel at the top of my list when I go back. Thanks yall! "Worst stay on the island. Horrible staff and they will overcharge you once you leave. Thay say military friendly buy hav"
Worst experience I've ever had on the island. They say military friendly but will overcharge you for your service animal once you leave . I asked for proof of what they were charging and it could not provide. Do not leave your credit card information with these people. This hotel is just a 5 minute drive to the beach, if that. The doors face the southwest so plan to have the air conditioner on starting around 3. It is right off the highway after coming over the bridge on to the island. Make sure and get an upstairs room! It has a ceiling fan, a great view and never hear anyone above you. Nice and cold air conditioners, head index was 110 outside but wind chill was 36 in our room. Haha. I know what you're gonna say, but the pizza joint across the road is super good. The hotel has a nice selection of a continental breakfast. There are eggs, Canadian bacon, biscuits and gravy, waffles and syrup, cereals, coffee, donuts, bagels, toast, cream cheese, peanut butter, yogurt and I believe some fruit. The owner of the hotel is very attentive to detail and is a family man, so he truly cares about your stay. Also Anette at the front desk is very nice, so please tell her thank you for her hard work! Stay here and you won't be sorry. "Good Value Motel in a Beautiful Location"
Best Western Padre Island is only 5 minutes from the Beach. Several good local restaurants are nearby, as well as Schlitterbahn. Corpus Christi is just down the road on the other side of the Intracostal Bridge.Be sure to bring your chairs and your fishing poles. "Better than I thought "
State a couple nights at the Best Western to get away from the Heat. Surprisingly quiet despite it being completely sold out. As we checked in others were coming up thinking that the room was available but literally they were completely sold out. Adjustments have been made and they are still recovering from the hurricane two years ago. Pool is clean and the breakfast is decent with typical muffins breads Etc. If you get the second floor you can get a decent view of the Bay. Putt putt golf and HEB supermarket is about 2 miles away. There's a CVS Pharmacy down the street. Parking is adequate as a lot of Big Texas style trucks park here. The queen side bed was very comfortable but not enough soaps and toilet paper so you might have to call housekeeping. Overall better than I expected always trust my reviews. "Good motel near the beach"
Our room was very clean, however had a bad night sleep because the mattress extremely firm. Nice little pool area with palapas. WiFi for our room was non existent- I think they could use a booster. Breakfast was decent. Staff was very friendly. "A must for the Best Western lovers"
Had a fantastic time here, the staff was awesome and the property was clean and neat. The downfall was the breakfast area when it is busy, very congested and poorly laid out. The upside is the staff, they were the nicest and most friendliest that we have seen on this trip, Thank you!!! Best western was great. Rooms were clean. Shampoo/conditioner a little small for 2 people but not that big of a deal. Decent breakfast. Pool was clean and always empty. The room price was very affordable. Dear Annie E, Thank you for taking time to share your thoughts of the service you felt you received. I first would like to apologize for all the issues encountered as I feel there were so many misunderstandings. We take fault for the $108 rate that was quoted, it was our teams responsibility during the phone call to state which days had that price as the daily rate, and confirm rates for each day. We apologize that the emails were not received promptly, as it's very possible it was our computer issue. The front desk manager is aware we do not record phone calls, if she stated we did I truly am sorry, that is not standard for us as it's against the law to record phone conversations without consent. I take full responsibility for the cancellation of your reservation. On our phone conversation it was stated you were no longer coming to Corpus Christi. I apologize for the misunderstand and making assumptions based on that statement that you would want me to cancel the reservation. We do not want our guest to feel as though they are unwelcome or receive horrible customer service, even potential guest who choose not to stay with us. I assure you re-training and reiterating policies to our staff are underway. We take this circumstance to really learn the things as a team and individually how we can make the customer service better for our guests; as in the future we will do mandatory re-caps of reservations with daily rates and totals. On behalf of the team and myself we sincerely apologize for all the misunderstandings that took place. We wish you safe travels in the future! This is the best experience at all of the Best Western hotels. I will stay again and again. The hotel staff were extremely helpful. The rooms were fantastic The food was great. The location was perfect. "Great place to stay. The real treasure on padre island"
We have been going for years and they always take fantastic care of us. Anytime we have any question or concerns they are met with a friendly and respectful answer. Our pets join us and enjoy the hotel as much as we do. This hotel is on Padre Island. We love to stay here because it is so close to the National Seashore. The bottom rooms seem to be recently updated from when we stayed a few years before. The room we had was nice and clean. The only complaint would be there is missing light bulbs in the lamps. Only two had bulbs. I thought that they just kept them out to keep the electricity low, but when we checked out, the manager said that someone must have "stolen" the light bulbs. We did not eat the breakfast, but the coffee was good. During booking, the front desk of the hotel was uncapable of making a reservation. so I had to make my reservation through the call center. Upon arrival, I understood why I had so much trouble booking (very limited staff and no on-site management). On the second day, no one cleaned our room (while we were out all day). I got to take out my own trash and take my dirty towels to the laundry room. After that I had to find someone to let me in the the utility closet so I could get some clean towels, kleenex and toliet paper. I do these chores at home but now I got to pay someone so that I could do them while I was on vacation. I reported this to corporate and I got the standard CYA email back from the general manager of that hotel. Never apologized or stated any corrective measures will be taken, so that other people will not experience the same vacation. He only said we dropped the ball. I would not recommend staying at this Best Western location. The staff was new and was not very knowledgeable about the rewards program. However they were training on the programs and trying to get better. They were also polite during the process. For me, politeness goes along way. The facility was clean. The breakfast was the same BW breakfast. No excitement there. Overall nice, clean hotel. The hotel was cleaner than expected and the rooms were nice on the inside. Nice location, close to the beach and many good places to eat. The landscaping around the building and the pool area is a little bland and boring but overall was a nice place to stay for the rate and location. This hotel was located shortly after reaching Padre Island. We enjoyed ocean views from our nicely decorated vaulted & spacious room. Nice hotel, great breakfast and good service. The pool was very well maintained with large towels available at the front desk. I would return. I'm sure this would have been a better experience if construction wasn't underway.When we 1st arrived,the toilet seat wasn't attached to the bowl,did get moved to another room,but other people's hair ties were in the restroom,so not sure how if staff is cleaning the rooms properly. Thank you yellagyrl20 for taking time to review and share your recent stay with us. We do apologize for all issues encountered during your stay. We do awknowledge the construction put a damper on your stay, as we also hoped it would be finished. Unfortunately due to hurricane Harvey and all the people and business affected construction is taking longer. To all guests we assure you we are trying to push construction along without compromising the integrity of the repairs. We appreciate bringing attention to us the issues encountered in the restroom, we will definitely be following up with housekeeping on this matter. We value all of your feedback, and we hope if you're ever in the area again that we would have the opportunity to make a better impression. Thank you again and safe travels. Great place for the price, but needs work. First off they didn't have extra blankets and I had to go buy one. Second the bathroom showers and toilets whined when used. Kept us up on n off all night. Our shower barley worked and last the pool was dirty and cold. The website did not say seasonal pool. djbjconstruction thank you for taking time to share your recent stay with us. We appreciate all feedback, as it will enable us to become better and provide an even better service to our guests. We sincerely apologize for all issues encountered during your stay with us. We definitely encourage all guests to notify the front desk of any issues so that the team can rectify any and all issues. We apologize that there were no additional blankets available and the sleepless night you experienced due to the noise of the piping. Please rest assure all of these issues will be looked into and resolved within a timely manner, We appreciate your time and feedback. We hope if you're ever in the area you'll choose to stay with us, Thank you and safe travels! Best place in town! Highly recommended to everyone especially those who are travelling with pets! Room 101. Stayed Dec. 24- Dec.28!!! They have complimentary breakfast. The floor are tiles , good for pets! Lobby was welcoming, staffs are awesome especially that lady that worked on the 24rth. Picked this hotel for a one night quick visit due to location being near the beaches and not far from town. The other hotels in this area still had a lot of renovations in process based on reviews. Stayed in one of the upper floors away from the main road as I had read could me lots of road noise. Room was very clean and comfortable. Service was good and Breakfast room very clean and a nice selection of food. We had right when the opened at 6 as we wanted to go down and see the sunrise on the beach. "Not a Place to stay when you book a fishing trip that leaves in early AM"
Generally good. Heater did not work for such a cold night. Did not get good sleep before getting on board with a fishing guide at 6:300 AM. It was tiring to fish all day and then take a long dive back home. It may have been better for me to drive there to arrive at 6:30 AM than to try to get a good night sleep in a cold room. jimfS2200CF on behalf of the entire team here at Best Western Padre Island we are sincerely sorry that your stay was not up to standards. We would like to apologize for this also interfering with your festivities while visiting North Padre Island. We appreciate all of your feedback, and take this as a learning lesson for how we can continue to improve. We are certainly looking into all the heaters to assure they work properly while this winter weather is upon us. We hope in the future you would give us another chance to make the impression of the high standards we want to uphold for our guests. Safe travels. Best Western was clean, friendly and convenient for our Beach Birthday Celebration. The pool was cool and relaxing. Padre Island is a very friendly place and it looks like we will be coming back to Best Western. We took are grandsons for a five day trip to Padre. The hotel was nice inside and out. housekeeping did a great job cleaning up the sand we tracked in from the beaches. The pool was clean and the pool area was nice. Very nice stay and a good value. We stayed here with some friends a few weeks ago. Great location between Corpus and Port A. Great breakfast. Rooms were nice and clean. Management very accommodating. We are going to start spending more time fishing and this will be the place we stay. We had a wonderful 3 nights. It was a great location. Corpus was just across the causeway and Port Aransas could be reached without taking the ferry. Great restaurants close by. The staff was great professional and helpful, Very good breakfast. "Best Western North Padre Island"
Staff is very friendly and rooms are clean and comfortable. Great location. Half way between Corpus Christi and Port Aransas so we didn't spend a lot of time driving. With Port A still in the process of clean up from Harvey it was nice to be able to go down and spend time on the beach and spend some tourist $'s to help them get back on their feet. I would stay here again. We try to go to the North Padre Island or Port Aransas beach every summer. This was the first time we stayed at this hotel. Nice and clean, great location close to beaches, and good price compared to some other hotel options on North Padre Island. Thanks for a nice stay. good location for beach access...rooms very nice...pool area and pool very clean...good lighting in parking area...nice staff...only problem was pool towels offered not available in pool area. Would recommend. This is a very nice hotel. Great staff, clean and comfortable rooms. Minutes from the beach. Great nearby cuisine. Great for families. We will definitely return! The staff gave excellent recommendations for good beaches, shops, and restaurants. They were extremely helpful and even gave our car a jump when the battery died! Nice outdoor pool under the palm trees. Everything from the beginning to the end of our stay was great! The hotel staff was great & went above & beyond. I highly recommend staying here. You won't be disappointed! The hotel even looks just like the pictures on the website, which is not always the case. the staff was great and helpful. The breakfast was not bad. It had different options to choose from. I would rather have a room with carpet instead of tile, but I think hotels are starting to change to tile floors instead. It was a good location, not far from the beach. This hotel was easy to get to, right next to a park, and close to several public beaches. Although the hotel was not on the beach, it was in a good, quiet location, and the price was similar to that of hotels on the mainland. In general, a good solid hotel with a nice hearty breakfast and decent wifi. "Absolute gem on the island"
This property is an astounding value for a stay on North Padre. Every employee we encountered during our 5 day stay was unfailingly polite and helpful. Room was clean and spacious - we had an upstairs double with vaulted ceiling which made the room seem even larger. Bedding was changed and beds made daily. Fresh towels and new shampoo/conditioner/soaps/lotions in place daily. Pool towels and any additional blankets or towels were immediately available from the front desk on request. This is a small property of about 40 rooms, all of which face the intercoastal waterway to the west, giving anyone interested in looking a fabulous sunset each evening. Immediately to the north sits Packery Channel, so the property is effectively bound by water on two sides, which gives a lovely breeze when sitting at the pool. The pool itself, while small, was cool, refreshing and sparklingly clean (water and adjacent area) every day. Multiple loungers, table, chairs and two palapas provide shade and seating. Immediately outside the fence 3 picnic tables and a BBQ pit allow for family grilling. 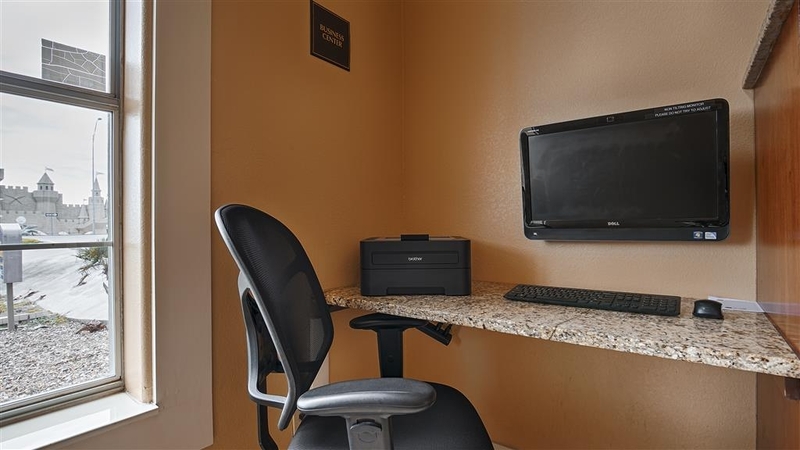 Each room comes equipped with a slightly larger than dorm sized fridge and small microwave, as well as coffee maker with all the things necessary to make coffee. There is little need for room coffee, however, as a full breakfast is served from 6AM to 9AM daily. In addition to the rather typical continental fare of pastries, coffee, juice and cold cereal, breakfast includes two waffle makers, a variety of breads for toasting, scrambled eggs, biscuits and sausage gravy and a hot meat (while we were there this was either bacon, sausage links or sausage patties) each day. Our family of four vacations on N.P.I. every summer and this was the easiest, most laid-back and stress-free vacation in recent memory, and I can honestly say it was because of our stay at this Best Western rather that our typical condo. Kudos to the employees. There are TWO POINTS that need to be made, however. As neither of these are the fault of the hotel and cannot be changed by them, I am not lowering my rating. But if you are staying here they should be pointed out. Sadly, the property immediately adjacent to the north is under construction. While were there (7/16-7/21) the workers started up the heavy machinery (backhoe, tractor, etc) prior to 6AM. This didn't necessarily wake us up, as we are early risers and were on the 2nd floor, but may be a problem for those who are. The second issue is that there is no direct cutthrough in the median of the highway to enter the parking lot. This means that in order to get into the parking lot when coming onto the island you have the bypass and u-turn. Similarly, when leaving the parking lot to go down the island and to the beach you have to drive to the light and make a u-turn. This is at most an inconvenience, but worth noting. Finally, we were told that the construction was for a shopping mall, so hopefully this means a single story building. But in future the hotel's lovely view of the water may be blocked. We sincerely hope that this does not become the case. It was good enjoyed the scenery the front desk person was super nice and extremely helpful. But room need a little more cleanest especially the rest room,but everything else was good. If I was to go back to Corpus I will stay there again. Staff is courteous and excels in what they do. They go above and beyond to make sure you feel as close to home as possible. Every time I call to make a reservation, the staff is very helpful and polite. In our previous stay, we were mostly happy. Unfortunately, this time we had problems with our room rate when we checked in (higher than the BestWestern.com rate confirmed in email). Then they said they'd fix it "later." When we checked out the rate was not fixed. The front desk people couldn't do anything about it. So we had to wait 30 minutes for the manager to come to the hotel and fix the rate. We obviously didn't want to see if it would get fixed after we got home, since they had already not fixed it once. The room was full of mosquitos, so that the first night we had to kill at least 20. The room also smelled like smoke. On the upside, it wasn't very loud, just regular noises, such as hearing a baby cry on the other side of a connecting door. eilers78751 thank you so much for sharing your experience with us. We appreciate all of your feedback and honesty. First and foremost we would like to apologize for the issues of the room rate and checkout encounter. We take full responsibility for the miscommunication on our end that resulted in a delay in your departure. We highly appreciated your patience during this situation, as we have had some staff changes and staff training taking place. We are very sorry for the mosquitos; unfortunately this issue has been city wide due to the recent weather conditions, rain, heat, and humidity causing the increased mosquito presence. We are trying to contain that situation following the city recommendations and additional pest control. Thank you for the loyalty you have shown us, we wish you and your family safe travels in the future. Clean, well maintained, complimentary breakfast is a plus. Great location to access all the activities on "The Island" and to get back to the mainland for supplies etc... very helpful and reasonable too. Parking lot specifically for boat trailers is a plus. "I HOPE THIS HOTEL FALLS INTO THE BAY!!!" "Only one more room left...", then turns around and hands out more keys to following people. Room was FULL of mosquitoes. A/C hummed and buzzed ALL night. Rooms stink! Floors FILTHY! Room not clean. Noisy. Uncomfortable beds with tiny pillows. DO-NOT-STAY-HERE!!! Justin W thank you for taking the time to review your stay with us. We would like to sincerely apologize for the inconvenience's you experienced during your stay. It is unacceptable for the rooms to be dirty and the floors filthy, we have high standards we set for ourselves and the experiences we want our guest to have. We highly encourage bringing these situations to our attention so that we can rectify the situations immediately, as we agree these issues should never be anything our guest have to encounter. The mosquitos have been an issue for us and all of Corpus Christi at this time, unfortunately with the recent weather conditions, rain, heat, and humidity; this has increased the mosquito presence. We do apologize but please rest assure we are doing as much as we can to decrease this issue by treating as the city recommends and having pest control treat the property. We are sorry that your stay was not a pleasant one and we take this experience as a learning opportunity for us to do better, educating our staff to ensure better experiences for our guest. We wish you and your family safe travels in the future. Loud noises due to the hotel maintenance in the day time. Brocken arm chair was replaced immediately upon request. The room was changed upon request due to the noises from the maintenance crews, loud AC unit, and nonfunctional door lock. The staffs were helpful and listen to the guest complaint (important). Mosquitoes are very aggressive in the hotel premises. Everything was excellent. Will be back soon. The beach is literally down the road and anything else you could possibly need. The turtle rescue is next door to the hotel and is is something you don't want to miss. Traveled with small children. Pool and hotel clean. Staff helpful and friendly. Breakfast was great. I normally hate hotel breakfast. It was the best I have had. I would stay here again. Only downside was a lot of people standing outside smoking. It beats having a smoker in room next to you. Four guys checked in as we checked out. You could smell smoke through the wall as we were packing and getting ready to leave. "Nice Place to Stay on the Island"
We were pleasantly surprised with our stay here. This is an older Best Western, but it has been updated. The biggest positive for it being older is the thicker walls! We stayed for two nights, and we had zero noise from the rooms on either side. I can't say about noise above because we were on the second floor. We also didn't hear any noise from the highway even though we were very close. This hotel is on the edge of town as you're leaving the island, so it's quiet for that reason as well. The bed was okay; not the best but definitely not the worst I've ever slept on. I'm cold natured, so I wish there had been a comforter on the bed, or an extra blanket. There is a small refrigerator, a microwave, and a coffee maker. This is a motel style hotel with all the rooms opening to the outside. All of the rooms have a view of the bay and the JFK Causeway. We would definitely stay here again. "Enjoyable and a nice view"
We stayed here spur of the moment on a family trip. Very nice view from the second floor, new rooms are large and cleaned up a little old-fashioned. Breakfast buffet was very nice. Overall we would stay here again, a great value at $99 for a beach vacation. Very close to multiple beaches on Padre Island. "Friendly, Clean, Really Great Location, Hidden Gem"
We really loved staying here. The hotel was very clean and well kept. We really liked the location; it's just a few minutes drive to Whitecap Beach. We also liked that it's close to both Corpus attractions and Port Aransas. I felt like hotel was in a quieter part of the city, away from a lot the congestion and crowds. It's quiet and the beds were comfortable. From management to front desk and housekeeping, the staff was very accommodating. We also used the pool a few times; it's just the right size for the location and was very clean. The office provided fresh towels for the pool. We saw that many of the guests were there for fishing trips; the hotel had a special area for the boats that was convenient for the guests but not intrusive. The rooms on the top floor have vaulted ceilings which I thought made the room feel bigger. The TV was a good size for the space and modern. The breakfast was hot and fresh. The coffee was good. The fresh, hot coffee early in the morning is important to me. I appreciated that the hot breakfast provided plenty of protein. Our trip started off really well before we even got there thanks to the wonderful front desk. Our trip also ended well thanks to the housekeeping staff and awesome manager. It was just a really good stay. I feel like I found a hidden gem in both the hotel and this part of the city. Another thing worth mentioning is that although it's not beachfront, it does have a water view and is very close to the water. Slept well, felt safe and enjoyed some time to myself. The staff was very friendly and willing to please. I don't eat breakfast, so have not comment there, but many people seemed to really enjoy that. I was very, very pleased. Overall, the BW North Padre Island Hotel is excellent. The mattresses on the beds are superb. The staff are excellent. The complimentary breakfast is excellent. This is a great property and better than the "higher dollar" hotels on North Padre Island. The staff was welcoming and friendly, the rooms were super clean which is unusual near beaches, they serve a hot breakfast, very convenient to beaches, local eateries and shops. This hotel is also pet friendly. Loved the fact that you offered a full breakfast. Every time the front doorbell rang a staff person would immediately show up. Constantly checking on all food items. Selection was very good. Helped me get a great start with a complete breakfast. Staff is great and friendly. "close to the beach and restaurants"
close to the beach, clean rooms, clean pool, free breakfast, plenty of parking, laundry on site, parking area for boats, view of Laguna Madre from second floor. onsite staff 24 hrs. FYI watch your children in the parking lot as cars pull in off of the main road very fast sometimes. "Enjoyable stay - wonderful staff, very clean rooms, good breakfast!" Room was clean and the hotel was also clean. Good reception but no place to rest outside except a picknic table beside the pool. We could easily heard our neighbors. The hotel is near Padre Island park and it was a good location for our vacations. "Clean with comfortable beds and accommodating service"
Excellent staff, assisted with check in and saved a downstairs room for access to parking and bringing my fishing tackle and ice chest so I didn't have to leave the valuable rods and reels in my truck. The parking lot and hotel was quiet. The beds are very comfortable, which is very important, as both of my rotator cuffs were torn and required surgery and metal pins, and 4 cervical vertebrae are fused. There should be more staffs like the staff at the Best Western. Convenient it was a nice place to stay convenient to surrounding places: restaurants, etc.There were no problems with the staff. They were very helpful. The breakfast was better than most. I would stay there again. Enjoyed our stay. Location was great for what we were doing. Only drawback was the bed, could not sleep very uncomfortable. Staff was helpful, and nice. We also enjoyed the air show that was going on. We stayed one night in a first floor room. We arrived on the island a day earlier than expected and this hotel had a room available when we needed it. The front desk staff was very helpful over the phone when booking last minute and pleasant at check-in. Our room was clean. Tile floors (which are to be expected in beach properties) made the room seem a little cold. The room was just average in size and accommodations. Hotel location was right on the main road on Padre and close to the bridge headed into Corpus. The pool looked nice with tiki hut type shelters, but we didn't get a chance to try it. We did notice that there were chargers in the parking lot for electric cars. Breakfast the next morning was good. Standard for Best Westerns including pancakes, eggs, sausage along with pastries and cereals. Overall, this hotel met our needs. It felt safe, clean, and had a really good location. 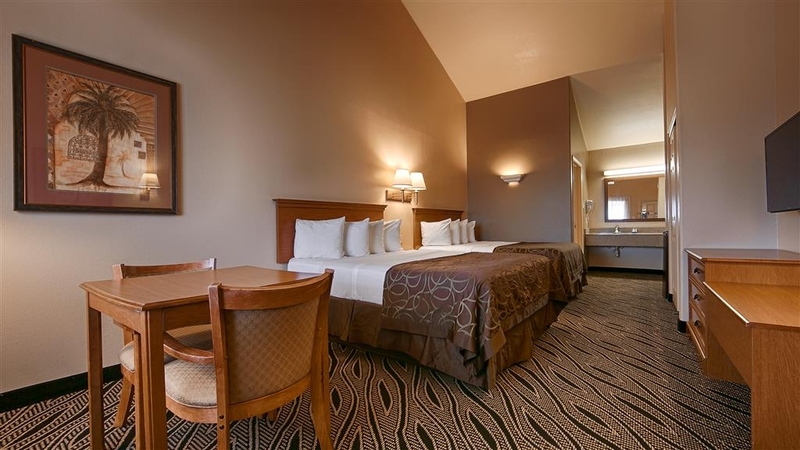 "Great hotel, nice room, friendly staff"
This hotel was exceptionally clean and well maintained. Rooms were spacious, clean and beds were very comfortable. The room had a nice sofa for sitting and a mini refrigerator and microwave. Great hot breakfast served each morning. Centrally located. Have stayed at this hotel various times, good location for the places we go fishing. Basic breakfast not freshly made like another BW I have stayed. Personnel are great, always willing to help if you need anything. Check-in person always smiling, says if you need anything let him know. Went out of his way to correct issue I had as I was leaving. joelZ4211QR thank you for taking the time to share your experience while staying with us. We appreciate your many compliments to our exceptional staff; these will be passed to our team. We are grateful for your loyalty and hope to see you again soon! "Spontaneous weekend to the beach!" Jkmann93 thank you for taking the time to share your recent stay with us! Your experience with us is our upmost priority, and we are very pleased that we were able to accommodate your needs. We would like to also thank you for your recommendations, they are very important to us and will definitely be taken under consideration. Thank you again for providing your feedback, it is much appreciated, and we look forward to your next visit! "Three nights on Padre Island"
Our experience with this motel was terrific. All employees I interacted with were very friendly, helpful and professional. The room was very clean and beds quite comfortable. Maintenance has been good and everything in the room worked well. (Internet often slow but that's typical) this motel fit our needs perfectly well. It's not fancy but clean, comfortable and quiet. When we return to the area we would stay there again. ROGER B thank you so much for all your positive feedback on your recent stay with us. We are very grateful for your continued loyalty, and we look forward to seeing you in your future travels! I called and inquired about dog friendliness and was told it's just a $20 fee and booked my room online. Upon check in I was told they are out of dog friendly rooms and denied my check in. I had to find a new hotel last minute with a pregnant wife and my dog. It was very unpleasant and the staff was rude about it. Please avoid if you are traveling with a dog. stangboris thank you for taking the time to share your experience with us. First, we would like to apologize for the misunderstanding regarding the pet friendly rooms. Upon further investigation we were unaware that you did have a pet, as the online booking did not state a pet would also be arriving. Being conscious that some guests have pet allergies, we allow pets in certain rooms (first floor) because of certain accommodations we have made to the room, such as tile. We are delighted to be an animal friendly hotel and take great pride in being able to provide that service. We do acknowledge the flaws that can be created because of the online booking not being able to show if pet friendly rooms are available. It is never our intention to be rude to our guest or potential guests, and as a team we sincerely apologize, and appropriate coaching to staff has taken place. Our priority with every guest is to have incomparable customer service, making your stay away from home feel like home. As a team we strive to achieve a higher level of service, and we hope that in the future you may give us another chance to make a different impression. We wish you and your family well in your future travels. Called the location and was told they are dog friendly for $20 fee. Booked online and arrived to be told that I was supposed to tell them in advance that I have a dog and denied my stay. I went down the street to La Quinta. No Dog fees, clean rooms and saved $80 for the same night in total cost. Avoid this place if you have a Dog. "BEST HOTEL ON PADRE ISLAND, Corpus Christi, TX"
This hotel has two floors with exterior room entries. Very convenient if you are there for the beach of fishing. You park your vehicle right outside your room. Nice pool. Breakfast. The hotel has been updated recently and has nice new wood flooring-----no carpet for beach-goers! When we stayed, the rooms were so fresh & clean!!! ArvellaB thank you for taking the time to review your stay with us! We know you have many options in choosing a place to stay during your travels, and we greatly appreciate choosing us. We hope that you will come visit us again! "VISITED CORPUS CHRISTI TO GO FISHING WITH A TOP GUIDE IN THE BUSINESS!" Arrived and was greeted by a very nice young lady with a smile on her face! A great start to my stay!! :)..You would have thought I was the special guest of her day....Her name is Rochelle. She helped us with ordering food in, which by the way, was a terrific pizzeria.She even made me a fresh pot of coffee at 9pm in the evening, with no hestitation! We will stay there again just because of her and her attention to customer service. A top notch team member, you should keep her around..thank you Becky Kerbow..
"Over Priced and some of the rudest staff ever....."
The price and close proximity to the beach were what led us to this hotel, and we had a very good experience. The rooms were comfortable and clean and the staff was friendly and very accommodating. This hotel is not fancy, but we weren't expecting it to be. The breakfast was good, the area felt safe, and there was lots of parking available. There were lots of dogs staying at this hotel, which only bothered me when one inconsiderate guest let her dog bark all morning. I can't blame the hotel for that though. Overall, we had a great stay. Haven't stayed here in years but were happy to see it was recently renovated. Our room looked brand new. Very comfy and clean. The A/C is loud and leaks outside which is sloppy but that was about all we can complain about. Breakfast was fresh and they had numerous choices. Coffee, juice and water as well. Very close to Padre beaches. Pool is clean and a nice way to cool down after a long day at the beach. We'll be back! RVargas98 thank you for taking the time to share your experience and feedback with us. Every year we strive to make upgrades that will make your stay more comfortable and memorable, because that is what our guest deserve. Thank you for bringing the A/C issue to our attention, we will promptly look into it and resolve any issues we find. We will look forward to your next visit! After a hot day, the partying in the parking lot till after midnight, a lady yelling at her kids in a foreign language, the pipes in the wall rattling all night and a defective air conditioning system, was not pleasant. Then take a shower and have dirt from the floor washing down the drain. We were scheduled for three days/nights - left after one night! Raymond S first we would like to start by apologizing that your experience was not an enjoyable one. We like to give every effort we can in making each guests' stay a positive experience. We definitely encourage every guest to notify an employee of any issues taking place so that the situation can be rectified. We want all of our guest to have a great time, but not at the expense of negatively affecting another guests' stay; such as a noise disturbance. Thank you for expressing your different experiences you had while staying with us. Your feedback is invaluable, enabling us to improve so that we can make appropriate changes and prevent other guest from having a negative experience. Again, thank you and we wish you safe travels. "Well done on the Remodeling"
We have stayed at this facility numerous times the past several years. This has been our go to hotel due to its proximity to the beach. What a wonderful surprise to see the room was remodeled and CLEAN! I really appreciated the CLEANILINESS of the room as well as the renovations in the room. It certainly appears to be easier to clean. The four pillows were a nice benefit too. Overall, it was refreshing as a customer to see the upgrades. A big THANK YOU to the cleaning staff for their hard work to make the room clean and comfortable. 476joo first we'd like to say thank you for being a loyal guest. Secondly, thank you for sharing your feedback and compliments. We appreciate the compliments on our housekeeping department; we believe they are pretty great too. We are pleased to hear you like the different upgrades we have made and hope you will come see us again soon. "Upstairs room with fan hard to beat"
Extra-large room on second floor with ceiling fans. Took a room far away from main office. Breakfast good. Friendly and helpful staff. Handouts in lobby, dining area helped in deciding what to do each day. Because I read one of the newspapers, we attended a free program on growing tomato plants at the South Texas Botanical Gardens & Nature Center. Recommend: Catfish Charlie's for seafood, JB's German Bakery and Cafe, Padre Island National Seashore. Would stay here again if we were in the area. Duffbeerdude thank you for taking the time to share your experience with us and TripAdvisor. We are pleased we could assist in recommendations for different activities and dining options. We hope if you are ever in the area you'll consider staying with us again! Room was spacious, and very clean. serve a very nice breakfast daily. Pool was nice and clean always. If anything was needed for the room the hotel staff we great. Hotel is not to far from Padre & great places to eat. Great hotel. Nice pool with bbq pit. Not directly on the ocean but next to a whataburger for late night cravings. Clean room, fabulous showers, ac in our room was a little loud but worked great. The staff was excellent. Right across the street from a gift shop for any little trinkets. Off the bridge to the mainland but was well insulated. Didn't hear any traffic all night. Easy check in & out we had a last minute reservation and everything was great. Loved the room the staff was great and the pool was beautiful. Location was easy to access as well as parking close to our room. We will be going back to this location over the next year! "Staffed worked hard to meet our needs"
Unfamiliar with the area, we drove up to an unattractive exterior. I forgot to request a 1st floor room, and the cot I did request wasn't available at first. My first impression was, "This is going to be a disaster!" But the woman at check in rearranged things so we got on the first floor. She went hunting for a cot and brought it to my room. The room was spacious, with a nice little table and chairs, microwave and fridge. The room was clean and tiled not carpeted, which is a plus in my book. The beds, including the cot, were very comfortable. There's a nice laundry facility, and the pool area looked very inviting although we did not use it. The breakfast area, fare and presentation was the best continental breakfast I've ever seen. I thought the room was a little pricey, but what really sets this hotel apart is the staff! Every member that I came in contact with was friendly, helpful, caring and a very hard worker. The breakfast area was packed, but the food never ran out and the tables were promptly cleaned. I would stay there again. This Best Western is one of the only hotels that we will stay in while visiting Corpus. The rooms are always very clean and the staff is always friendly. I would highly recommend staying here if you are in the area. the hotel was a great stay for my family and I, the pool's water temperature was perfect and great for swimming with the family. the variety of breakfast items were good. Hotel was not too far from the beach, We really enjoyed our stay at this Best Western Hotel. "very good hotel to stay"
"Another Great Stay at the BW Padre Island"
This BW is located at the head of Padre Island, just over the causeway from Corpus, around the corner from Port Aransas and 10 Miles to the National Beach. The staff is helpful. The breakfast was good. The pool was great. This is our second stay here and hopefully we will be able to stay at this BW again. The handicapped facilities were quite good - especially the bathroom and the walk in shower - absolutely pristine everyday (thanks housekeeping) and easy to use. This place exceeded our expectations. We got a last minute deal for a quick weekend getaway on a hotel website. Pet friendly, which is essential for us, we have a lap dog. Not on the beach, but a quick drive. Staff extremely friendly and helpful, rooms were clean and welcoming. Breakfast was great, usual waffles, eggs, sausage, biscuits and gravy, muffins, toast, cereal, juice, choices of pastries/bagels, oatmeal. We would stay here again. Excellent value. "Smokers and pet owners rejoice"
If you're a smoker or a pet owner, you'll be happy to find this nice motel. The island doesn't have many options for you. Our second-floor room was very recently remodeled, and thus attractive. It had vaulted ceilings, small table and chairs for snacking, a ceiling fan, and a fridge/microwave. 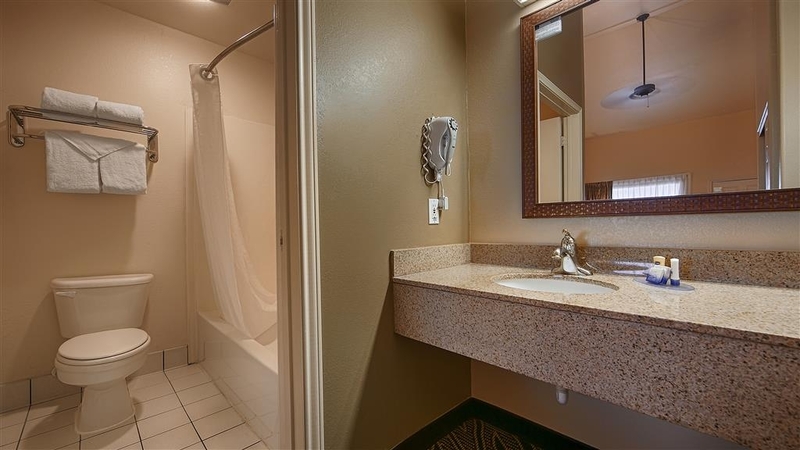 The sink is outside of the bathroom, so that can be pro or con depending on your preference. The shower had good water pressure. Just like another reviewer, we thought the mattress was too firm. The view off the motel landing was very nice: across the dunes and towards the intracoastal waterway. The pool also sits next to the dunes, so that's attractive too. The breakfast was your standard free hotel breakfast, like you'd get at comparative hotels. Dogs are not policed, so someone tied theirs off to the motel landing and it barked incessantly. This motel is not on the beach, but less than 5 miles from a beach access, which is excellent. The price was reasonable and they even accept pets for about $20, I'm not sure if it is per night. Room was very nice, and clean. Only issue that was experienced was bed comfort: hard mattress made for an achy body the next day. Need more comfortable mattresses, pads. Service was terrific, and morning breakfast good. Please add bacon to breakfast bar. Thank you Roxanne W for taking the time to review your stay with us. We appreciate your all your feedback, it is incredibly valuable to us. We are pleased that the service you experienced was terrific. All your concerns will be taken into consideration and looked into thoroughly. Thank you for staying with us and hope you will visit soon! Really nice Staff and really nice rooms, very clean. The most comfortable bed in a hotel chain that I have slept on. Great pillows too. Plenty of towels that were super soft as well. Pool is sparkling blue with a nice view!. Continental breakfast was super, made my own waffles and loved them! Hotel is really close to the beach, shopping and Restaurants. Paul P thank you for sharing your review with trip advisor and with us here at Best Western Padre Island. We are so very delighted that you enjoyed your stay and appreciate your many compliments on our hotel and invaluable staff. We take great pride in wanting to make every guests experience one that will be memorable and stress free. We hope when traveling to Corpus Christi/ North Padre Island you will choose to stay with us again and we look forward to your next visit. Very nice property/stay. Very clean bathroom area. We were on first floor and it was completely tiled. Looks nice but could have used a couple of area rugs maybe. Only negative was poor weatherstripping around room door which let directly to outside (no interior corridors). Thank you Roger S for taking the time to provide feedback on your recent stay at our hotel. We value your recommendations and will definitely be taken under consideration. From all of us at Best Western Padre Island we look forward to your visit in the future! This was a nice, clean hotel. They serve a decent breakfast and the staff was friendly and helpful. The hotel is conveniently located to almost everything on the island. Would definitely stay here again. I am picky about clean and comfortable. Visiting PINS so this is close and convenient to Corpus, Port A and Mustang Island. Room was clean and smelled very faintly of bleach. No carpet!!! Loved that. Most comfortable bed ever! Great AC! The pool while not huge was also really clean. No mildew, no unnatural debris and had excellent sturdy sun loungers. Our room had iron and board, coffee maker, micro wave and a clean fridge. Plenty of towels, a wet bag and nice soaps, lotion etc. The lobby and reception were orderly and well kept. On the front door is an award for hotel excellence. The staff were friendly and professional. Morning breakfast had scrambled eggs, sausage, bacon, a waffle station, pastries, cold cereal, fruits and yogurts. The attendant to the dinning area was detail oriented and efficient! There was plenty of coffee and condiments even at 9am. My favorite souvenir shop is across the street. Doc's Seafood is just down about a quarter mile and can't be beat for flavor and atmosphere. We loved our stay and will definitely book here again. "Friendly Staff, But The Rooms Need A Makeover"
Thank you rugger4to8us for providing feedback of your stay with us at the Best Western Padre Island! We are very sorry that there was an issue with the air conditioner. With the summer upon us we take this very seriously and will be looking into all the A/C units to make sure they are running efficiently. We sincerely apologize for noise issue, and we encourage guest to notify front desk staff when noise nuisance arise. Please be assured we will follow up on noise complaints and aim for everyone to enjoy their stay. We strive for our hotel to be a great experience, one that guest will want to keep coming back to when they travel to North Padre Island and hope that you will give us another chance to leave a better impression. We hope to see you soon! Dirty, old, very outdated. Nasty carpets. Wouldnt stay at this hotel again even for the cheaper price. The breakfast was ok. Normal cereal/fruit/coffee/muffins. 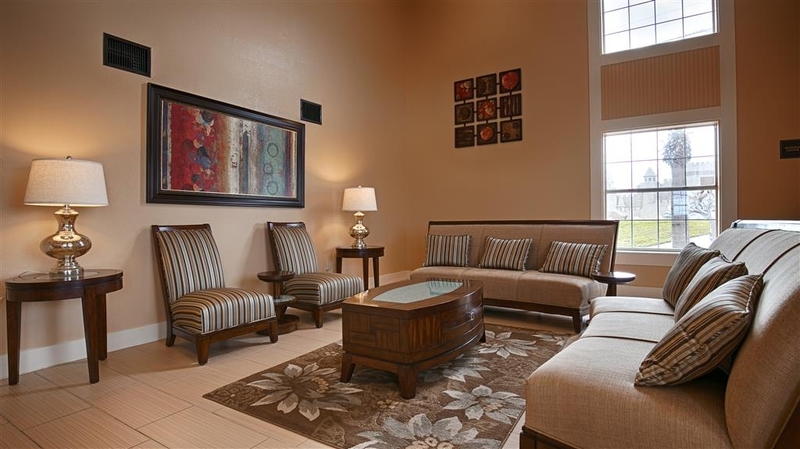 It would look and feel much better with fresh paint, fixtures and updated carpeting and lamps! "Not the best Best Western we've stayed at"
We have been Best Western Rewards members for quite some time and always try to choose them whenever possible while traveling, which we do a lot of. This Best Western in particular had a great staff which we always seem to be satisfied with, however, the beds claimed to be queen yet were full size and the bedding was too small for the beds, so my husband and I were fighting for covers the whole night. The a/c / heater unit was inconsistent and had a hard time keeping the room at a constant temperature. The walls were very thin, and we could hear our 'neighbors' TV all night. The breakfast looked and smelled amazing, yet made both of us ill. The eggs and sausage both seemed to be low quality imitation (fake not real). This experience will not keep us from going to Best Westerns, as this is one of many times we have been to their hotels. And generally always have an amazing experience. But unfortunately, we will not choose this specific one again when traveling through the Corpus Christi area. Roaches. Loud appliances. Grey bed sheets. Smelly towels. Friendly staff but.... roaches. Misleading advertising - what looks like a regular hotel (and I have been to some nice Best Western properties) is indeed an old motel. We haven't been on holiday in over 26 years (life got in the way)! 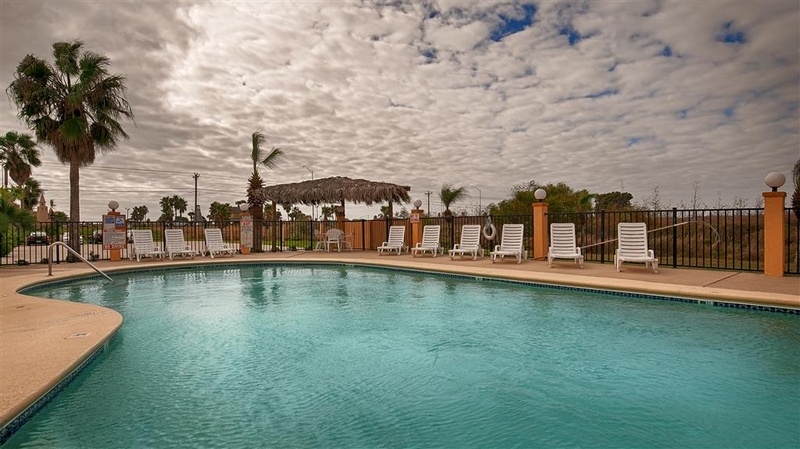 We thoroughly enjoyed the property, service, and location at Best Western Padre Island! We selected BWPI for their "pet friendly" policy... $20.00 per day wasn't necessary for our girl, but we understand. This was the first "road trip" for our 7 year old Doberman! Needless to say, the experience of staying in a motel room was new to her. She did very well. She never heard anyone in adjoining or upper rooms to cause her to bark, calling our attention to others (or bothering anyone else)! Thank goodness their pet friendly policy is ground level rooms! The only thing that caused a bit of discomfort - mean stickers in the grassy areas that we had to walk through for our Dobie bathroom breaks! But, that's Texas! The breakfast was EXCELLENT! We were amazed with the choices and freshness! Oh, and I'm thankful they have coffee available 24/7 in the lobby area! The room's coffee pot (ONE CUP at a time) wasn't near enough for this avid coffee drinker! Hopefully, it will not be another 26 years before another holiday break away from real life. When we go back to the beach, we will again stay at BWPI!!! I have stayed at this hotel multiple times and have always been satisfied. I will stay again! The staff was so good to me and my students. It is a wonderful place for families with children. No night noises. Fantastic service and great rooms! Staff very helpful to meet your needs. Clean, comfortable well maintained property. Great location, good views, in house breakfast well presented and above average hotel breakfast food. Our go-to in Corpus. The staff are always so kind and the rooms spotless. 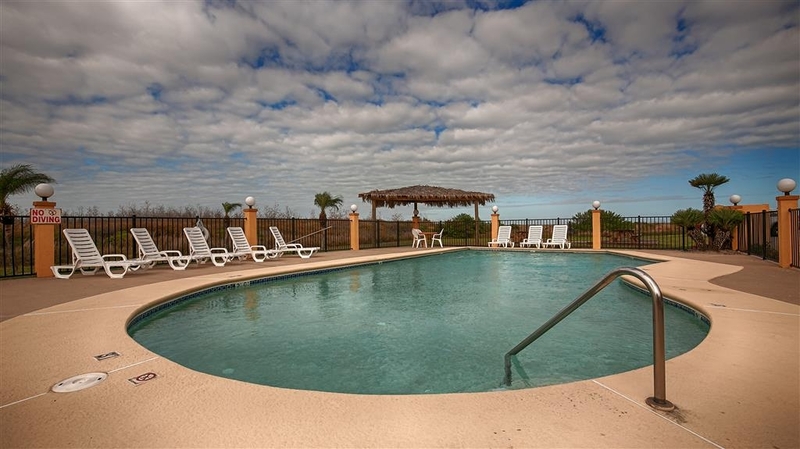 It's a great location to move between Corpus, Port Aransas and Malaquite National Seashore. They have a pool, free breakfast (not just a roll and oj, real food) and pets are allowed. Very reasonable price. This was our first time at the North Padre Island Best Western. The rooms are very clean, staff was very professional and nice.We can see why others come back over and over again. We will too! PS Some new pillows would be nice. Beds are very comfortable. Called twice to ensure connecting rooms since we were traveling with kids; at noon we were guaranteed rooms 207/208 would be ready when we got there. We arrived at 430 and neither room was cleaned. My daughter went back to the office to tell Mary that 209/210 wouldn't work as they were separated by a staircase she was told that was what they had. I didn't settle for that answer and Mary all but told me to take it or leave. Understand, this was not peak season we purposely chose after spring break was over to go down on off-season. Thankfully one of the housekeepers said she would get the rooms made up. The hotel is ok, we got an $88 rate off Hotels.com and that is all this property is worth. I am not sure how they have a 5-diamond AAA rating or a 5-star Trip Advisor rating, the property does not warrant it. The room was nice enough, the beds are hard. It had a microwave and fridge. Had an issue with our sink, was fixed promptly. The connecting rooms were perfect with the kids and glad I pushed the issue. Housekeeping is non-existent so if you have that expectation this is not the place! They serve a hot breakfast and the waffles were great. Family of 4 stayed here for 3 nights in March. The room was clean and comfortable, all rooms open up to outside with a nice view of the bay. The hotel is on a highway but not right next to anything so it is quiet. We did not use the pool instead choosing to go to the beach, they let you take hotel pool towels to use on the beach which is very nice. Breakfast was good with hot items, which is always pleasant surprise. I did do a load of clothes in the onsite laundry and the facility was adequate. We would stay here again in a heartbeat and recommend to other families searching for comfortable accommodations. Our two rooms were not together as requested and one-half the family was on the top, second floor and the other half on the ground floor. The rooms were very basic and the staff was not able to clean the rooms and change bed linens and towels as scheduled. Our room went two days without any cleaning and we had to ask for clean towels. Overall, for a Best Western Rewards member and fan, not a good experience. Great staff and clean location, no problems everything worked out and will definately stay again. Really nice location and easy access to beach and the highway. The rooms were clean and very roomy and accomodating! "#1 hotel on Padre Island"
I will not stay anywhere else when on the coast. This team takes excellent care of us every-time we step through the door till we check out. I always feel like a valued guest and will always be thankful for the welcome feeling after the 2 hour drive there. This is the place to stay if you are going to visit the coast!!!!! This was for a 7 night stay. This review done on second day of stay. Access to hotel was excellent. Easy to find via GPS. Lobby/atrium/breakfast area, (all in one), was quite striking. Eating breakfast the first morning was a good experience. The room make-up person arrived just after we returned from breakfast. She asked about room make-up and we responded that we needed a few minutes, but would then leave for her to do the room. As I complete this review we are waiting for her return three-and-a-half hours later. The room is very large, with sofa, chairs, king bed, table, desk, large bath area, and a very basic kitchen area. ( It is described as an all-suite venue.) Lobby staff were friendly and efficient. Laundry facilities were located on the top floor, (3rd). The location of the television was a puzzle to me as watching from the sofa/living area was not possible, and viewing from the bed was also at a rather extreme angle. The furniture, from my perspective could have been arranged more effectively. Wonderful spot to watch the sun go down. Staff very friendly and helpful. Pet friendly with lots of green area for them to use. Would certainly stay here again. Great spot to stage your island vacation. "THE PLACE TO STAY ON THE ISLAND!" On reading some of the reviews I wonder if we have stayed at the same place. From check in to checkout we have been very pleased. On check in when I told the desk clerk I had a small registered service dog and offered to show her his registration she very nicely Said it was not necessary. The room was clean the bed comfortable I could control the temperature. We had nice hot showers. The breakfast was tasty with choices as to what we had. The staff was all real friendly even the ones that couldn't understand me. Nice to see staff with smiles on their faces. If we ever come back we will be sure to stay here. I just returned from Padre Island, TX. We stayed in this Hotel. We really enjoyed our visit,very good costumer service, the hotel is very well located, it is close to the main attractions. Friendly staff. We were leaving a little before 6:00 am and the front desk person was super nice to open the breakfast room for us to have breakfast before leaving. 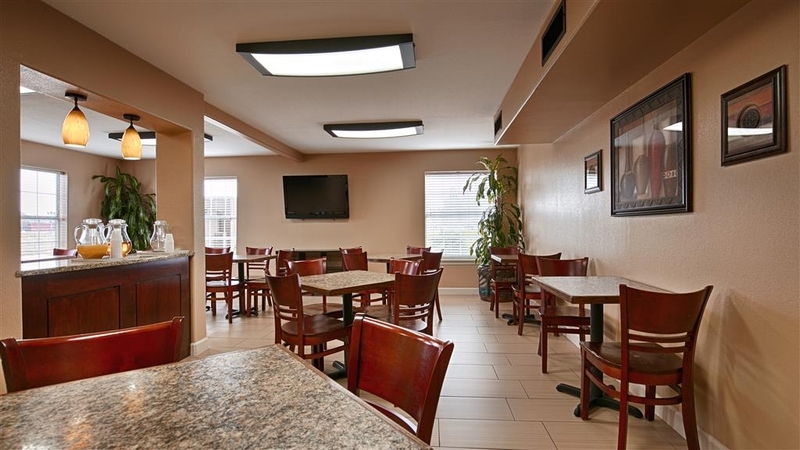 "Best Western on the Island - Corpus Christi Tx"
This is an excellent hotel if you are fishing the Corpus Christi area and/or have a boat, the hotel is very accessible and has ample parking, the rooms are clean and staff is helpful. 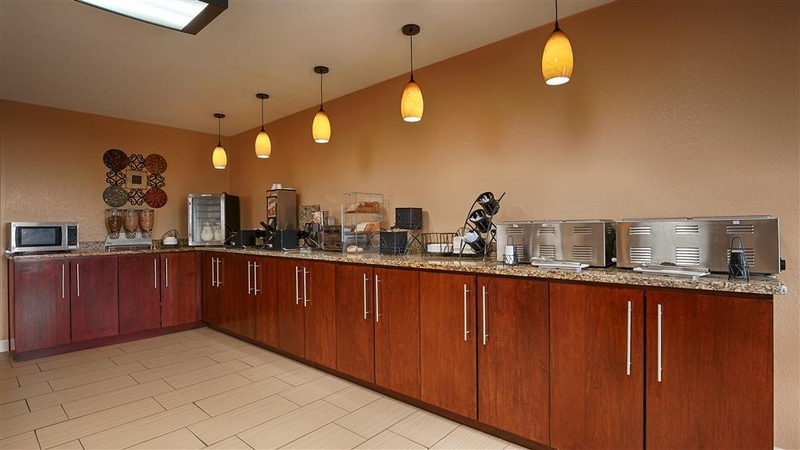 The continental breakfast is good and convenient. Room was nice. Front desk lady was very nice and helpful. he breakfast was ok. I would definitely stay here again. The price was very good also. The bed was very comfortable. The front desk person made a slight mistake in billing us, but it was corrected by the morning person. As soon as I pulled up to the hotel, I was asked if I was ready to check-in. The lady behind the desk was pleasant and extremely helpful. The rooms were clean and the heater worked very well. ( it was cold that day).There was a lot of variety of foods to have for breakfast. This was no fruit only breakfast. Overall I was pleased with my stay, and would do it again if I am in the area. Beach access is minutes away to include PINS. "GREAT SERVICE AT CHECK IN"
We checked in on Christmas Eve & the person behind the front desk of the hotel provided a very friendly experience. Since we were on vacation, we requested that the free breakfast timings be extended by half an hour & the person seemed empowered & more than happy to oblige with the request. He provided valuable information for the dining places that would be open on this Christmas Eve. The room was clean and spacious, well-equipped and everything worked well. We waited nearly an hour to check-in after our arrival at 3:45 p.m. The quality of the plates and dinner ware for breakfast was CHEAP, CHEAP, CHEAP. The plates had to be doubled or tripled to hold anything and the dinner-ware bent when I tried to cut something. We (including my husband and 2 miniature schnauzers) received a warm and inviting welcome from the front desk clerk. The facility is well maintained, clean and quiet. It includes enough green space with picnic tables and a charcoal grill for us to enjoy as well as our 2 four-legged companions to stretch out in. The room is spacious including a sofa, moderately-sized flat screen TV, microwave, mini fridge and tiled flooring for easy clean up. The free breakfast included a variety of items (i.e. waffles, breads, eggs, bacon, yogurts, cereals, juices, coffee, etc.) that were more than filling. The young lady who "manned" the breakfast area was very sweet and welcoming. This hotel and it's staff tried to accommodate all my needs and concerns. Security of my vehicle is one of the biggest concerns I have. Plenty of cameras, and staff patrols area, Very well lit (except for the fog) open areas to accommodate larger vehicles, boats, trailers etc. Easy access and traffic flow back to Corpus in the morning is pleasant. 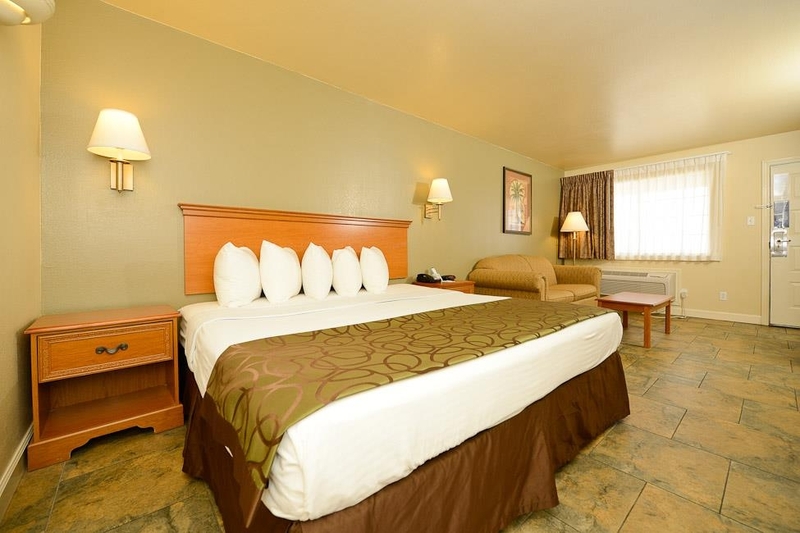 "Hotel conveniently located, Very caring staff"
Handicap accessible room was very spacious and easy to get around in. Staff was friendly and professional and they went out of their way to make sure we were comfortable. Staff was knowledgeable about the .island and recommended good places to eat out. "Close to the water: Fishing/Hunting"
The location of this motel is great. 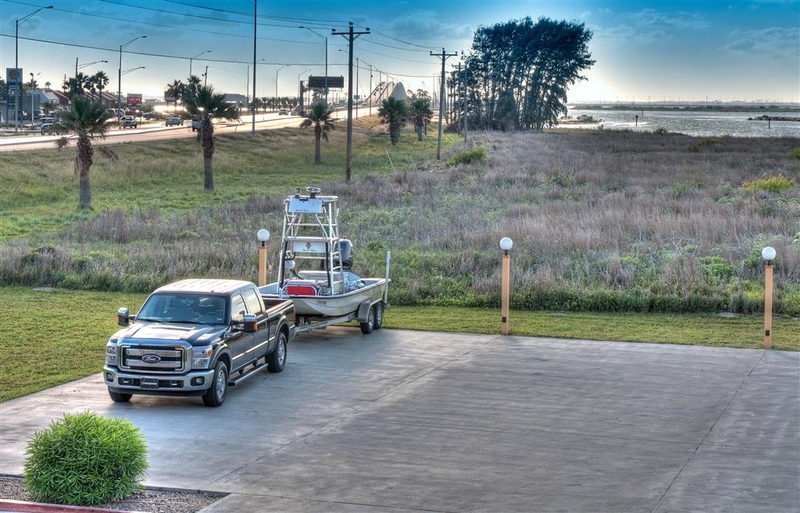 It is minutes away from multiple boat ramps and bait shops and easily accessible no matter where you are coming from on the island. The Packery channel runs directly behind the motel so you can quickly get to your favorite duck blind or fishing hole. There is also plenty of room for trailer parking with power outlets for charging batteries near by. "Just a get away "
Nice motel for the price. Clean, large rooms, and very friendly staff. The beds were very comfortable and the breakfast was okay. The beach was nasty! The red tide was in and the smell was unbelievable. Many dead fish added to the smell. Never thought to ask about the beach! But the motel was nice! for the price, the flooded fridge and wet floor, indicated the room floors may not have been mopped. That is not pleasant. It was off season, so the price should reflect that. It didn't. The breakfast yogurts should have been restocked. Again, not what I paid for. Booked this hotel from Trip Advisor. Got a really reasonable rate for the Island, so my expectations weren't that high. I was very surprised when I saw the room. It was very spacious and comfortable. The bed is a little firm but comfortable. The staff are very friendly and helpful. I stayed here during the week so I'm sure that why the rate was less expensive. I would definitely stay here again. "Great location to the beach and pets allowed!" Clean, super nice staff, free breakfast included and pets are allowed. We have two 60+ shepherd/lab mixes and they travel with us. This hotel allows pets and only charged a total of $20 extra for the dogs to stay the one night we were there. The beach is just a 5 minute drive (Mustang Island Beach- which also allows dogs). Perfect location and very nice hotel. As soon as we opened the door to the room there was this awful cleaning/chemical smell that took hours to dissipate. The bed pillows were plentiful but about one third of a normal bed pillow and kept slipping apart which was the cause of a restless night's sleep. excellent service and great breakfast for the whole family. staff always ready to make our stay more placent. Easy check in and out, frienly staff and verry positive people, with a lot of information for us to have a fun mini vacation. "Best Western on the Island"
Nice, inexpensive place to stay near the north Padre Island Beach. They are asking me to write 200 characters minimum but I don't have much else to say about the place. Again, my review is over and I just want to submit this so I can get on with my day. "Super friendly, Clean property, Nice breakfast"
I spoke with three different people that work for the hotel (checkin, breakfast, and checkout) all were very happy to see me; informative, smiles and polite. At checkin all my questions were answered before I could ask. The rooms were clean and large. Medium fridge and small microwave. The rooms were cool and surprisingly not humid. No sand present as well! Breakfast had eggs, sausage, waffles, toasts, cereal, and fruit. Hot and plentiful. Every room looks over the lit parking lot. it was easy for me to park in front of the room so I could see my car from the window. I saw two small boats parked in a lot off the main parking. Fast food and restaurants close by. An extended walk to get to the closest, or walk over the highway to fast food. (The highway slows down at night - noise was never an issue) Grocery is back on the main land (HEB and Walmart) CVS close by on island next to Stripes gas station. I thought I had lost my keys in the room after check out ... They went out of their way to check the room and to call me back to let me know that they didn't find them. They even looked under the beds. At no time did I feel like I was putting them through a hassle. They were so polite and responsive.